There are many ways to calculate affordable rent. Some people use the 40x rule since many landlords require that your annual gross income be at least 40 times your monthly rent. To calculate, simply divide your annual gross income by 40. Another rule of thumb is the 30% rule, meaning that you can put 30% of your annual gross income in rent. If you make $90,000 a year, you can spend $27,000 on rent, and so your monthly rent should be $2,250. While these rules are helpful, none of them factor in expenses. Renting an apartment can cost you more than you imagine. For instance, some buildings charge a pet fee for each pet you have. In New York City, your rent might go up by $35 for you to keep a pet. Other amenities also play a huge factor. Some buildings charge monthly gym fees and some others don't. If you live in a building that does not have a fitness center, you might spend more on gym memberships. Nor do the rules mentioned above take into account your financial situation or lifestyle. For example, a newly graduated might be carrying a student loan and has to set aside $200 to $300 per month to repay the loan. An independent contractor might need to have a liability insurance policy in place and has to pay for health insurance himself/herself. Our rent calculator gives you a more comprehensive view on how much you can afford by including monthly debt and estimated expenses. Such as student loan, insurance, etc. You can afford per month. Pie Chart Explained - we calculate your monthly rent at 25% of your monthly net income (after monthly debt). This allows you to have enough cash left for other expenses and savings. Utilities are in general 2.5% of your monthly net income, and so in this case, you should expect to spend or more per month on utilities. Food budget takes up about 11% of your monthly net income, according to the U.S. Department of Agriculture. In this case, you have to spend on food every month. Of course, your food budget goes up if you eat out a lot. Transportation is usually 5% of your monthly net income. In this case, your monthly allowance on transportation is . However, if you own a car, you might need to save more cash for gasoline, parking, car insurance, etc. 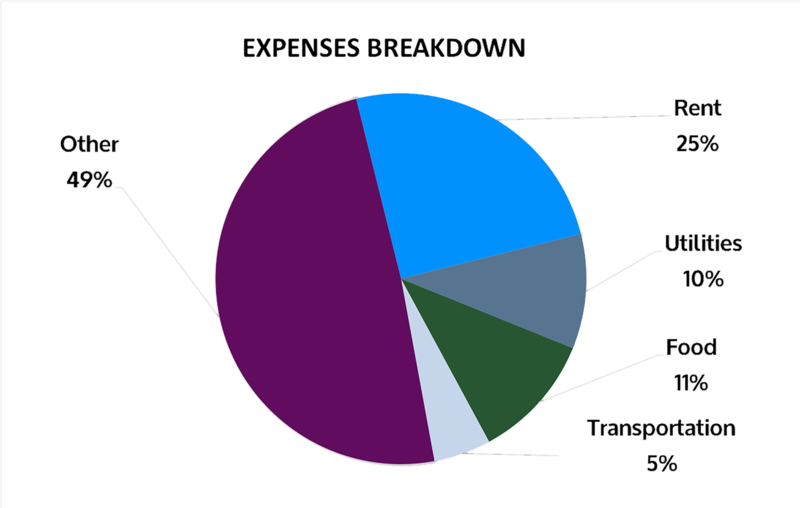 You have (57%) left for other expenses (such as entertainment and clothing) and savings. Renting an apartment might cost you more than you imagine. If you are renting with a bad credit score or no credit history, expect to put down more cash for security deposit. You might also find yourself in need of a guarantor if your income does not meet the landlord's requirement. Having a guarantor often means additional fees, but if chances are your family or friends will be willing to help out. You might also spend extra $10 to $30 per month on renters insurance. In short, keep in mind of all possible expenses when you estimate how much rent you can afford!